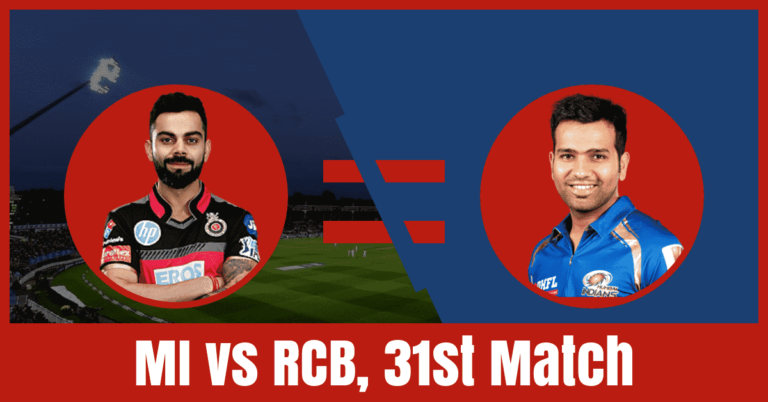 Who Will Win The Match Today of MI vs RCB 31st Match Indian Premier League 2019? After six matches, Royal Challengers Bangalore have finally managed to win their first match of the 12th season of IPL. Can they do the same today? Mumbai Indians are set to take on Royal Challengers Bangalore on Monday, April 15, 2019, at Wankhede Stadium, Mumbai. Royal Challengers Bangalore who have lost their six matches back to back until the last match. The big question is can the Royal Challengers make it to the playoffs. Royal Challengers Bangalore have played seven matches, won one and lost six matches. They are in the last position of the points table with two points in their pocket. This is the last thing RCB would have dreamt of. They have finally broken their losing streak by winning their last match against KXIP by eight wickets. Prior to that, they have lost against DC by four wickets and KKR by five wickets. Virat Kohli, AB de Villiers, Parthiv Patel and Marcus Stoinis are the top scorers of Royal Challengers team. They have scored 270, 231, 191 and 102 runs. Yuzvendra Chahal, Mohammed Siraj and Navdeep Saini are the top wicket-takers. They have taken 11, 6 and 4 wickets. 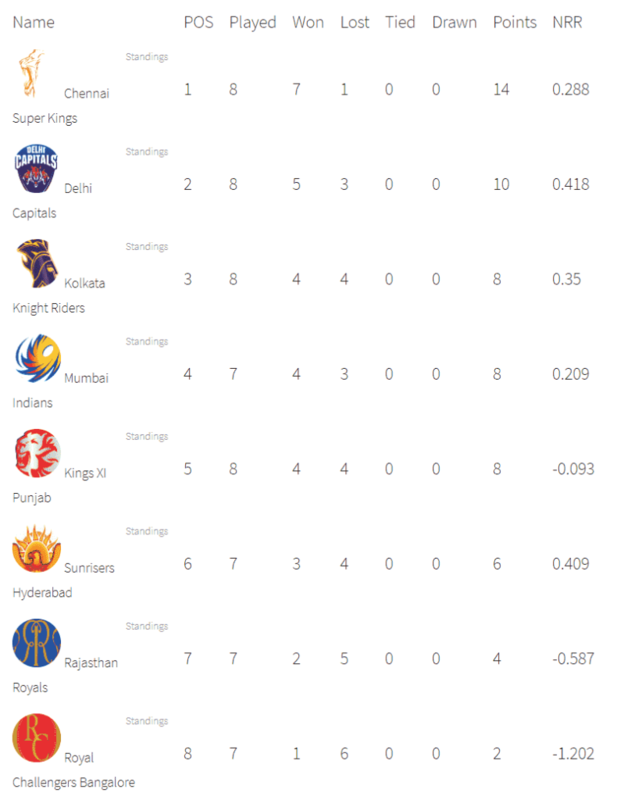 On the other hand, Mumbai Indians had a good outing so far in this Indian Premier League. They have played seven games, won four and lost three games. They are in the fourth position of the points table with eight points in their pocket. They have lost their last match against RR by four wickets. Prior to that, won against KXIP by three wickets and won against SRH by 40 runs. Quinton de Kock, Kieron Pollard, Rohit Sharma, Suryakumar Yadav and Hardik Pandya are the top scorers of Mumbai team. They have scored 238, 185, 165, 154 and 149 runs. Jasprit Bumrah, Hardik Pandya and Krunal Pandya are the top wicket-takers. They have taken 8, 6 and 5 wickets. Quinton de Kock, Kieron Pollard, Rohit Sharma, Suryakumar Yadav, Hardik Pandya, Krunal Pandya and Jasprit Bumrah are the key players of Mumbai Indians Team. The Mumbai team management may bring Lasith Malinga in place of Alzarri Joseph. Rohit Sharma, Suryakumar Yadav and Quinton de Kock will lead the batting department. Hardik Pandya and Krunal Pandya will play as a key all-rounder. Jasprit Bumrah, Jason Behrendorff and Rahul Chahar will lead the bowling department. Rohit Sharma and Hardik Pandya are the most valuable players of the Mumbai Indians team. Bowlers: Jasprit Bumrah, Rahul Chahar, Alzarri Joseph/Lasith Malinga, Jason Behrendorff/Mitchell McClenaghan. Rohit Sharma(c), Lasith Malinga, Quinton de Kock, Suryakumar Yadav, Mayank Markande, Kieron Pollard, Ben Cutting, Hardik Pandya, Barinder Sran, Ishan Kishan(w), Evin Lewis, Krunal Pandya, Pankaj Jaiswal, Alzarri Joseph, Mitchell McClenaghan, Rahul Chahar, Anmolpreet Singh, Jason Behrendorff, Siddhesh Lad, Jasprit Bumrah, Anukul Roy, Yuvraj Singh, Jayant Yadav, Aditya Tare, Rasikh Salam. Virat Kohli, AB de Villiers, Parthiv Patel, Marcus Stoinis, Moeen Ali, Yuzvendra Chahal and Navdeep Saini are the key players of Royal Challengers Bangalore Team. The Royal Challengers Bangalore team management may play with the same playing 11. Virat Kohli, AB de Villiers and Parthiv Patel will lead the batting department. Marcus Stoinis and Moeen Ali will play as a key all-rounder. Umesh Yadav, Yuzvendra Chahal and Navdeep Saini will lead the bowling department. Batsmen: AB de Villiers, Virat Kohli, Akshdeep Nath. All-rounders: Marcus Stoinis, Moeen Ali. Bowlers: Pawan Negi, Mohammed Siraj, Umesh Yadav, Navdeep Saini, Yuzvendra Chahal. Virat Kohli(c), Prayas Barman, Parthiv Patel(w), Colin de Grandhomme, AB de Villiers, Milind Kumar, Marcus Stoinis, Gurkeerat Singh Mann, Moeen Ali, Devdutt Padikkal, Akshdeep Nath, Himmat Singh, Pawan Negi, Mohammed Siraj, Umesh Yadav, Shimron Hetmyer, Yuzvendra Chahal, Washington Sundar, Navdeep Saini, Kulwant Khejroliya, Heinrich Klaasen, Tim Southee, Shivam Dube. The pitch of Wankhede Stadium, Mumbai is a batting friendly wicket. The batsmen can easily play shots and strokes making will be easy especially in the latter half of the game. The fast bowlers may get some help from the wicket initially. Dream11 Fantasy Cricket Tips: Try to take top-order batsmen in your team. The weather of Mumbai is forecasted to be mostly cloudy in the morning and mostly sunny in the evening. The sky will be clear and there is no sign of rain. The temperature is expected to be 30-Degree Celsius and the humidity to be 68%. Fantasy Cricket Tips: The weather condition may favour the batsmen. According to Crix11 astrology match prediction, Royal Challengers Bangalore will win the match today. Royal Challengers Bangalore will win the toss and opt to bowl first. You may like to read all fantasy cricket match prediction.